Do you want to support development of this free application? 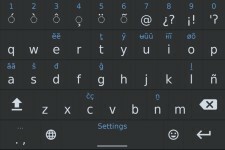 The South American Native Languages Keyboard app is an Android keyboard implementing special characters of South American native languages that use Latin-based alphabets. Its goal is to give users means of writing their native languages and as such to promote the preservation and growth of those languages and their cultures. The keyboard offers Spanish and Portuguese layouts and thus is usable for casual writing of those languages. On top of this it offers sets of special characters used in various South American native languages. Those characters are grouped under keys according to graphical or phonetic resemblance and are accessible after long press on the key. The uppermost line of the keyboard gives access to accents, that can be combined virtually with any letter. Download the South American Native Languages Keyboard from Google Play Store. Follow the standard installation procedure. The keyboard does not require any particular permissions. 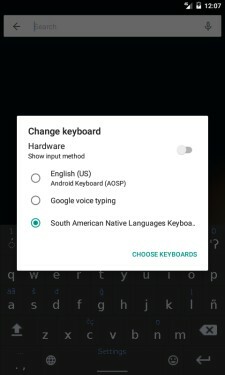 Activate the keyboard by going to Settings -> Language & Input -> Current Keyboard -> Choose Keyboards and click on the switch next to the South American Native Languages Keyboard label. Android will warn you that custom keyboards may be dangerous. Don't worry. This keyboard does not collect data of any kind. 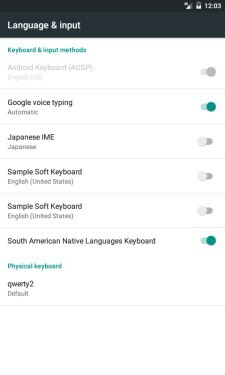 Go back to Language & Input -> Current Keyboard and choose the South American Native Languages Keyboard as your default keyboard. The keyboard comes in flavors to accommodate both Spanish and Portuguese writing users. Special letters proper to local languages are accessible on long press on certain keys. The first line of keyboard contains a choice of accents. Those are modifying characters, i.e. you need to write first the letter you want, then press the accent you want to give it. Some keys contain two accents. On single or double click on the key the first or the second one will be used. Single press on the Shift key will allow for writing a single uppercase letter. Double-pressing the Shift will lock it for writing uppercase text. Pressing it again switches to lowercase. Pressing the "globe" icon will switch to the next input method (likely another keyboard that you have installed). Single-press of the ". ," key writes a full stop, double-press writes a comma. Long press brings forward symbols keyboard. Long press on the Space key brings forward the Settings screen for the keyboard. The Smiley key adds a text smiley. Long press opens a basic set of text emoticons. I am grateful to Federico Villalta and Swintha Danielsen from Bolivia and working with the project GIZAC (University of Leipzig, Germany) for initiating this project, for their important feedback while creating this application and for their help with translations into Spanish. I am also grateful to Márcio Vilar for helping with the translation into Portuguese. The GIZAC project is documenting the Bolivian indigenous language Guarayu. The Guarayu people are very active in modern media, and a proper keyboard for writing their language properly was in place. So this keyboard also came into being thanks to the Guarayo and is now applicable for many more languages of South America. Older versions of Android, i.e. Jelly Bean and KitKat lack support for certain exotic characters (shows an empty space instead) and renders certain combinations of letters and accents in a "not-so-nice" way. To my knowledge there is no workaround for this. Since version 5 (Lollipop) Android renders all the characters and accents correctly. Using Android Lollipop and newer is strongly recommended. Do you have any comment or request to implement a particular missing character or a set of characters? Your feedback is welcome on dominik.ramik@seznam.cz or message me through my Facebook page. Fixed problems with the Enter key in searches.